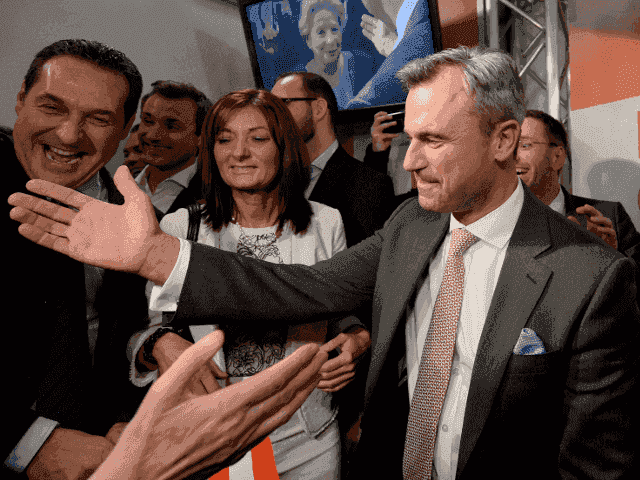 Europe’s populist right have hailed the unexpected success of the Freedom Party of Austria’s (FPO) presidential candidate in this weekend’s elections, but tactical voting in the second round may rob him of victory. Pollsters were once again proven to be wide of the mark this weekend as predicted strong also-ran FPO candidate Norbert Hofer stormed ahead to take 36.4 per cent of the vote. Trailing behind in second, both Green candidate Alexander Van der Bellen and Mr. Hofer were well ahead of the “establishment” governing People’s and Social Democratic parties who polled identically at 11 per cent each. Messages of support and congratulations flooded in from all over Europe after the result. Germany’s Alternative for Deutschland (AfD) said: “Our political ally in Austria has thus set a further sign, bravo”. Meanwhile Dutch anti-Islamification campaigner Geert Wilders hailed the vote as “fantastic”, reports Kronen Zeitung. Despite the result which put anti-Islam, strong borders, Eurosceptic former aircraft engineer Hofer in first place he could still lose out to the Green candidate. Because the FPO failed to get 50 per cent of the vote in the first round, Hofer will go to round two against left-Green candidate on May 22nd, giving voters from all other parties the opportunity to work together to oppose his candidacy. This phenomenon has been observed in other European countries, as even voters usually loyal to right-wing ‘conservative’ parties vote tactically to keep anti-migration right parties out of power. Breitbart London reported on this during the French December regional elections, where Front National candidates including “rockstar of the right” Marion Marechal Le Pen Provence-Alpes-Cote d’Azur came a clear first in the initial voting stage. Yet as France prepared to vote again, the left-wing Socialist party pulled out of the vote altogether, allowing their supporters to vote for centre-right candidates to block the Front National, who failed to secure a single seat. The situation is slightly different for Austria, where all but two candidates are removed from the competition. Yet it seems possible those 11 per cent who voted for the Social Democrat candidate, and the 18 per cent who voted for independent candidate Irmgard Griss could back the Green candidate, pushing him to nearly 50 per cent of the vote. This is backed up by the post-vote snap-poll taken yesterday by Austrian Television (ATV), which puts the Greens three points ahead of the FPO in the second round. Regardless, Austria’s FPO-backing largest newspaper hails the landslide as a “new political era” dawning and again sees the pollsters underestimating support for Hofer. Reporting an interview with Vienna political scientist, Thomas Hofer says the FPO can expect to pick up half the votes from independent candidates and many conservative sympathisers which would put him at 56 per cent, giving him the presidency. Although Hofer has already declared he would be a President “for all Austrians” and that none would have to fear from his election, it seems likely he would be one of Europe’s most robustly Eurosceptic, and anti-mass migration heads of state. Campaigning under the slogan “Austria First”, he has said Austria must stop taking refugees and that “I do not want this to become a Muslim country”.